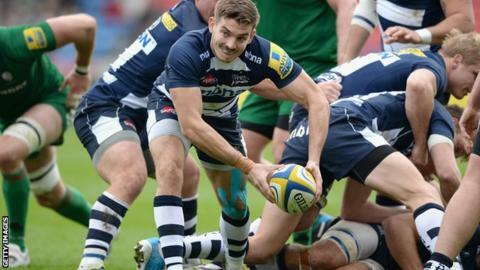 Sale Sharks scrum-half Will Cliff is hoping to increase his starts at the club after reaching 100 appearances. The 26-year-old started in the win against London Irish on Saturday to bring up his ton, but has made just 36 starts in reaching three figures. Cliff has spent most of his time behind Dwayne Peel and now Chris Cusiter in the pecking order at Sale. "I've got to an age where I'm in the squad every week, but I do really want to push on and start more," he said. "I've never seriously thought about leaving. I just want to be playing rugby so we'll see what happens." After coming through the Sharks academy, Cliff had a loan spell in the Championship at Leeds in 2011, and has been a main part of the matchday squad in recent seasons. "Peel just seemed to get better the longer he was here it seemed, so it was hard work with him," he told BBC Radio Manchester. "Cusiter has come in and done a really good job as well so they've been good guys to learn from. "It's nice to start, it does get frustrating at times but you do what you can, you keep your head down in training and wait for those opportunities." Meanwhile, Sale director of rugby Steve Diamond said he expects to announce a number of players who are out of contract next summer will be signing new deals in the coming weeks. Diamond, 48, has also again pressed the claims of fly-half Danny Cipriani to be given a chance with England after their losses to New Zealand and South Africa. "By current selection it looks as if people are being moved aside instead of being dropped - it's disappointing for the players who aren't in the squad to see," Diamond said. "The England team should be picked with players who are on form and it doesn't seem to be the case at the moment. "What Danny has behind a dominant pack, and England do have a very good pack, are those options to unlock defences. Sadly, he's not been given the opportunity."